Burgers are one of those things that I enjoy but find that I can’t eat as often as I’d like since they are so heavy. 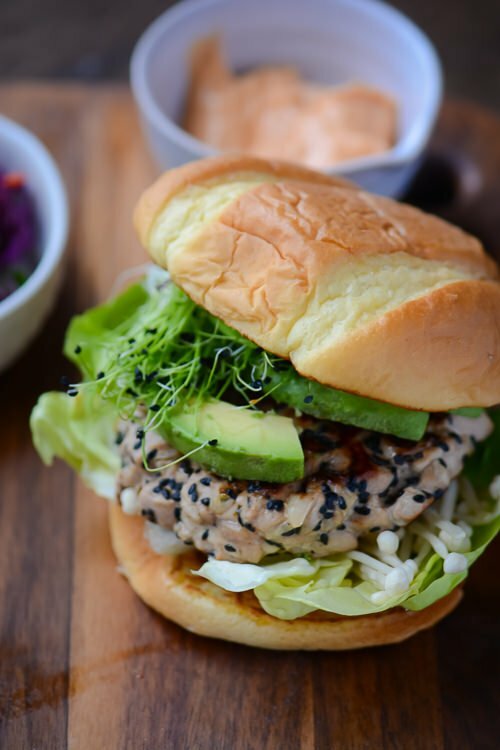 I find when the craving strikes these ahi tuna burgers with spicy sriracha mayo are just as satisfying as regular burgers but without all the guilt. 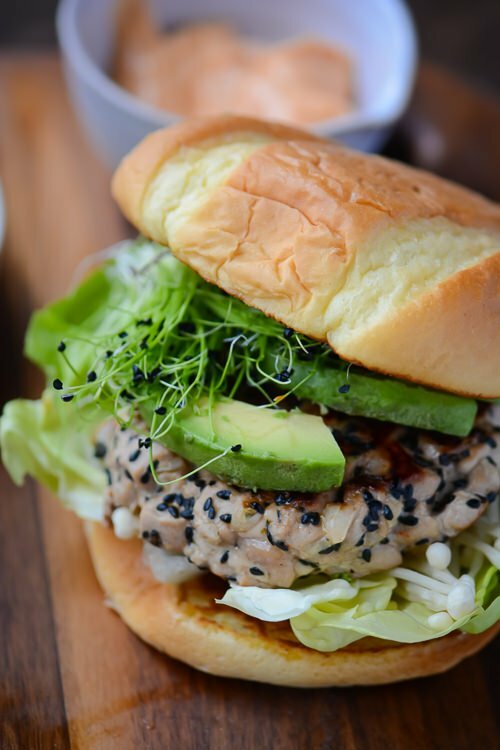 Most tuna burger recipes call for you to grind the tuna and then combine it with whatever you are flavoring it with, but I don’t love the texture. I finely dice my tuna and then lightly press them into patties. I’m not going to lie; you have to handle these very gently since they don’t have any egg to bind them together. Putting them into the fridge to chill for 15 minutes helps and treat them delicately when you are cooking them. A grill won’t work for these so use a hot skillet and only sear them for 2-3 minutes on each side to prevent overcooking. You want the burger seared on the outside but still raw on the inside for the best texture and flavor. 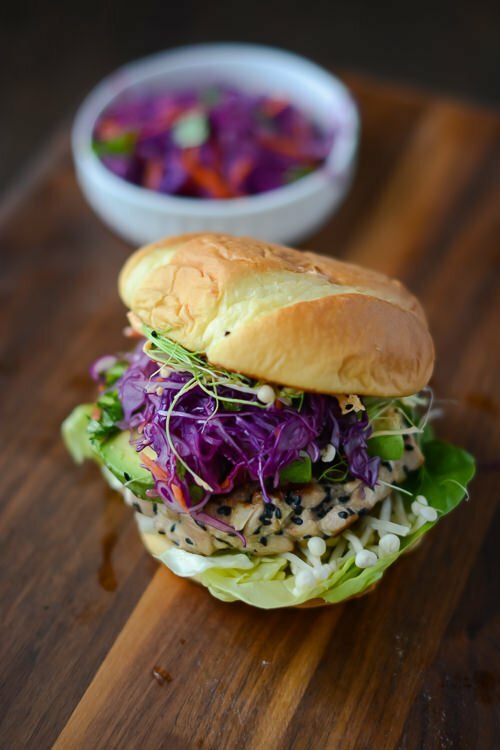 The mayo is a nice spicy compliment to the Asian flavors in the burger. Add more sriracha for a mayo with more kick if you’d prefer. Play around with how you want to dress these burgers. Feel free to skip the slaw and just top them with avocado and sprouts if you’re looking to save some time; they’re delicious either way. 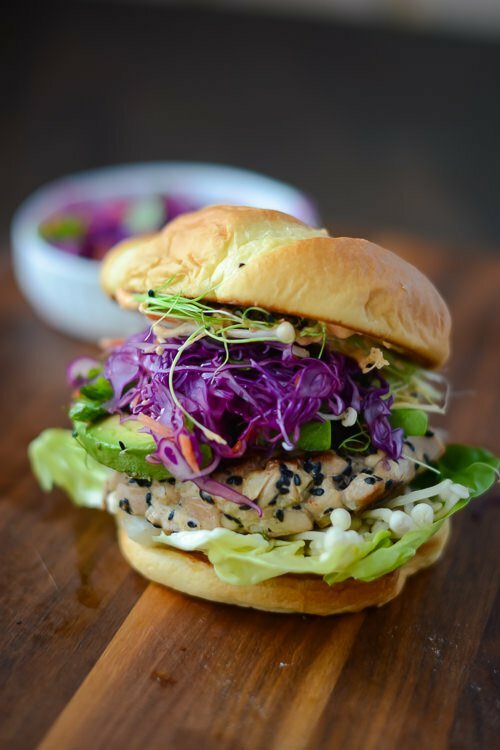 These tuna burgers are a healthier alternative when the craving strikes. 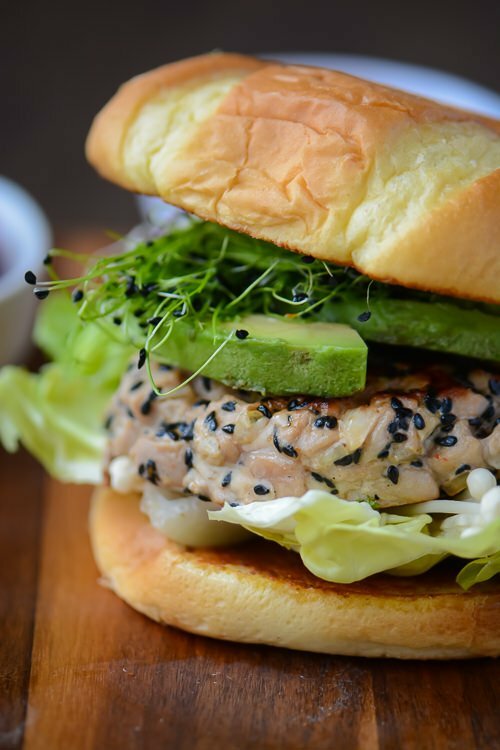 Finely diced tuna is combined with soy, lime juice, sriracha and sesame seeds to make the most flavorful burger imaginable! Combine all the ingredients for the mayo together in a small bowl. 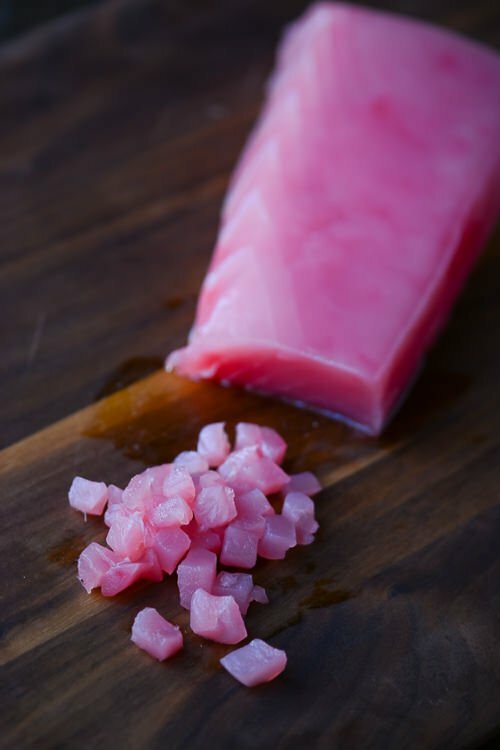 Combine the tuna, onion, soy sauce, sesame oil, sriracha, lime juice and sesame seeds in a bowl and toss gently to combine. Using your hands, divide the mixture into 4 equal portions and lightly press into a patty. Refrigerate for 15 minutes. Heat the olive oil over medium-high heat in a skillet. Make sure the pan is nice and hot before you sear the burgers. Add the burgers to the pan and cook for 2-3 minutes, gently flip the burgers over and cook for another 1-2 minutes, the burgers should just be seared on the outside but pink on the inside. Watch them carefully and make sure not to overcook them! To make the slaw, combine the cabbage, carrot sesame oil, rice vinegar and lime juice in a small bowl. Tear the mint into small pieces and add it to the slaw. Season lightly with salt and pepper. Lightly butter the rolls with the butter and toast the rolls, cut side down until toasted and golden brown about 3 minutes. Place the lettuce and enoki mushrooms on the bottom buns. 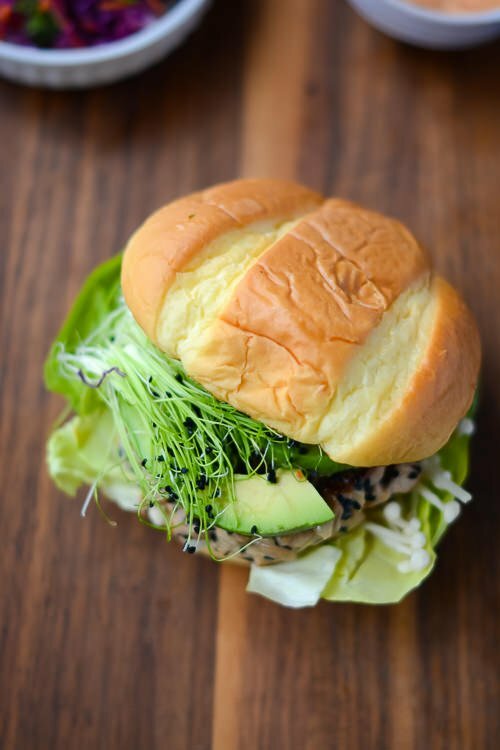 Top with one tuna patty, a few slices of avocado and a handful of sprouts. Spread a dollop of sriracha mayo on the top bun and place on top of the burger. Serve with extra sauce on the side. Yes Eileen, the rarer the better as far as I’m concerned. I basically took my favorite poke flavorings and created a burger with them. Your pictures here look amazing! Textures,colors,and simplicity. Made these last night. I only used sriracha in the mayonnaise abd these were over the top wonderful. Thanks for the recipe. I’m so glad you enjoyed the burgers. It’s so easy to lose the tuna if you combine too many other ingredients with them. We love to make rice bowls and just sear tuna steaks with the same seasonings. Another great option for a quick and easy dinner! Thanks again for trying the recipe!